The Common Core Standards has been embraced by educators and government leaders across the country. These common educational standards include standards that cover "habits of mind", which are very compatible with the Learning in Afterschool & Summer principles. Elizabeth Devaney recently worked with Nicole Yohalem and the Forum for Youth Investment in developing a policy brief entitled The Common Core Standards: What Do They Mean For Out-of-School Time? Below we interview Elizabeth Devaney on the Common Core Standards and their relevance to the afterschool/OST field. Q: For our readers who are not familiar, can you briefly describe what the Common Core standards are? How are they different from previous academic standards? A: The Common Core is the result of a two-year process, facilitated by the National Governor’s Association and the Council of Chief State School Officers (CCSSO), to develop a set of common standards for math and English Language Arts (ELA). The Common Core represents what students in grades K-12 should master in order to be college and career ready, and the hope is that the standards will increase the rigor and coherence of curriculum and assessment as well as increase alignment across states. Content standards are broken out by grade, highlighting specific competencies students in each grade level must achieve in the two main subject areas. The Common Core focuses on fewer standards at a deeper level than do many of the models used in the past. The standards also emphasize higher order thinking skills; that is, they focus more on demonstrating understanding of content and analyzing written materials rather than on memorizing specific content. The math standards put greater emphasis on understanding how to get to the right answer than simply answering a question correctly, and the ELA standards shift toward increasingly complex informational text. Q: Why are the Common Core standards important to out-of-school (OST) programs? A: The Common Core is important to OST programs just as state content standards have always been important – because they represent what students should know and what schools are striving to teach. If OST programs hope to align with schools and make the case for their contribution to student achievement, then they have to understand what it is schools are held accountable for. The Common Core simply represents a new and more focused approach to standards and place an emphasis on some of the higher order thinking skills OST programs have always championed. Q: In your briefing paper, you describe the "Habits of Mind" standards. What are these and how are they relevant to OST programs? 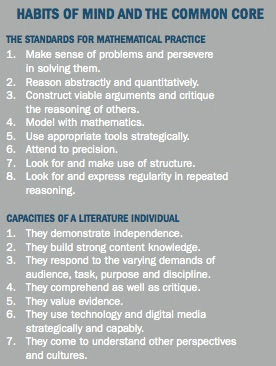 A: The Council of Chief State School Officers (CCSSO) describes habits of mind as “knowledge, skills, and dispositions that operate in tandem with the academic content in the standards … and offer a portrait of students who, upon graduation, are prepared for college, career, and citizenship.” In each of the two standards documents, math and ELA, there is an introductory section, separate from the content standards, which outlines these skills and dispositions that CCSSO references. In the Common Core math standards, habits of mind are reflected in the “standards of mathematical practice” – 8 specific competencies students need in order to be successful at math, ranging from perseverance to good use of tools. In the ELA area, they are reflected in an introductory discussion of “the capacities of a literate individual” and range from building independence to understanding other cultures and perspectives. Habits of mind encompass a range of skills that are critical both to academics but also to success in work and life. They include skills that many youth-serving organizations have long focused on. It is important to note, however, that the developers of the standards see these habits of mind as relevant for how they contribute to a students’ ability to perform in math and ELA. Although they are certainly transferable skills, they are only included in the Common Core for how they connect to a specific subject area. Q:How is the OST field presently engaging with the Common Core standards? A: OST organizations have already begun responding to the Common Core in a variety of ways. Several of the Mott funded state afterschool networks have begun to address the Common Core through professional development for OST staff. For example Utah and New Jersey have hosted training and institutes designed to inform program providers about the standards and help them think about how to align curriculum and programming to the content standards. Georgia and Washington have worked to embed references to the Common Core in newly developed quality standards for OST providers – in effect framing understanding of the Common Core as essential for a high quality program. Several city-wide intermediaries – TASC, PASA and the Partnership for Children and Youth – are experimenting with implementing policy initiatives, offering professional development, and reframing curriculum to connect with the Common Core. Although still early, these are promising strategies that will inform how the field more directly connects with the Common Core. Q: OST programs are being asked to offer programs that promote STEM, reduced childhood obesity, in addition to promoting academic achievement and broader youth development. Do the Common Core standards represent a piling on or do they represent an opportunity? A: OST programs are being asked to do a lot and must, by necessity, learn to prioritize and not take on too much. But I do think the Common Core represents an opportunity rather than a burden. As I mentioned earlier, the Common Core is not all that different from the state content standards that have existed and been a focus of schools for years. Any OST program that has been interested in connecting to schools or has a mission to contribute to the academic success of young people has had to think about the state content standards and so the Common Core do not represent something all that new and different. Rather, they represent a new framing – a more intentional and widespread definition of what students need to know. And because the Common Core is new and a lot of focus will be placed on them in the coming years, it represents an opportunity for OST programs to become better informed than ever. But I would also caution that because they are new and schools are going to be consumed by adopting and training their teachers to implement them that we as an OST community need to be careful not to jump in too fast. Elizabeth is currently an independent consultant working with, among others, the Forum for Youth Investment and the Providence After School Alliance. Prior to starting her consulting practice Elizabeth worked in a variety of educational organizations dedicated to improving the lives and chances of success for young people. She served as the Deputy Director and Quality Improvement Director of the Providence After School Alliance in Providence, RI. There she led the development of a statewide quality improvement system for after school and youth development professionals and oversaw the organization’s evaluation and monitoring activities. She also served as a Project Director at the Collaborative for Academic Social and Emotional Learning (CASEL) in Chicago, IL where her work focused on helping schools to implement comprehensive, school-wide social and emotional learning initiatives. Elizabeth has authored two technical assistance guides for educators and systems builders as well as several published articles and has presented at numerous conferences. She was the recipient of a Distinguished Fellows award from the W.T. 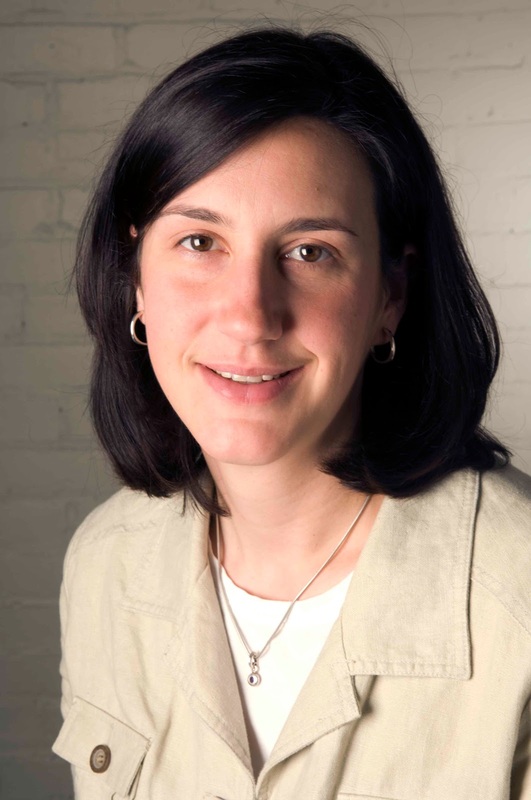 Grant Foundation in 2009 and received her masters degree in nonprofit management from the Heller School of Social Policy at Brandeis University. The Common Core is a catalyst to build a transformative education system that provides unique learning experiences for students while leading them to high scholastic achievement. However, it will take investment from all stakeholders, including expanded learning leaders, to develop the comprehensive supports our students, and schools, will need to achieve mastery. Making the Case for "Deeper Learning"